Jayne did a lot of work preparing for Evan's first birthday. She sent out invitations, got a cake and some balloons, and wrapped quite a few presents. 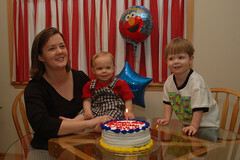 She even worked with both Ean and Evan on blowing out candles in the weeks prior to Evan's party. The evening was a lot of fun and I took a huge amount of photos of the event. Evan had a good time, but I think Ean couldn't contain his enthusiasm. Watching Evan eat his cake was pretty funny too. Mom let him get really messy.